Trace-element quality-control samples (for example, source-solution blanks, field blanks, and field replicates) were collected as part of a statewide investigation of groundwater quality in California, known as the Priority Basins Project of the Groundwater Ambient Monitoring and Assessment (GAMA) Program. The GAMA Priority Basins Project is being conducted by the U.S. Geological Survey (USGS) in cooperation with the California State Water Resources Control Board (SWRCB) to assess and monitor the quality of groundwater resources used for drinking-water supply and to improve public knowledge of groundwater quality in California. Trace-element field blanks were collected to evaluate potential bias in the corresponding environmental data. Bias in the environmental data could result from contamination in the field during sample collection, from the groundwater coming into contact with contaminants on equipment surfaces or from other sources, or from processing, shipping, or analyzing the samples. Bias affects the interpretation of environmental data, particularly if any constituents are present solely as a result of extrinsic contamination that would have otherwise been absent from the groundwater that was sampled. Field blanks were collected, analyzed, and reviewed to identify and quantify extrinsic contamination bias. Data derived from source-solution blanks and laboratory quality-control samples also were considered in evaluating potential contamination bias. Eighty-six field-blank samples collected from May 2004 to January 2008 were analyzed for the concentrations of 25 trace elements. Results from these field blanks were used to interpret the data for the 816 samples of untreated groundwater collected over the same period. Constituents analyzed were aluminum (Al), antimony (Sb), arsenic (As), barium (Ba), beryllium (Be), boron (B), cadmium (Cd), chromium (Cr), cobalt (Co), copper (Cu), iron (Fe), lead (Pb), lithium (Li), manganese (Mn), mercury (Hg), molybdenum (Mo), nickel (Ni), selenium (Se), silver (Ag), strontium (Sr), thallium (Tl), tungsten (W), uranium (U), vanadium (V), and zinc (Zn). The detection frequency and the 90th percentile concentration at greater than 90 percent confidence were determined from the field-blank data for each trace element, and these results were compared to each constituent’s long-term method detection level (LT-MDL) to determine whether a study reporting level (SRL) was necessary to ensure that no more than 10 percent of the detections in groundwater samples could be attributed solely to contamination bias. Only two of the trace elements analyzed, Li and Se, had zero detections in the 86 field blanks. Ten other trace elements (Sb, As, Be, B, Cd, Co, Mo, Ag, Tl, and U) were detected in fewer than 5 percent of the field blanks. The field-blank results for these constituents did not necessitate establishing SRLs. Of the 13 constituents that were detected in more than 5 percent of the field blanks, six (Al, Ba, Cr, Mn, Hg, and V) had field-blank results that indicated a need for SRLs that were at or below the highest laboratory reporting levels (LRL) used during the sampling period; these SRLs were needed for concentrations between the LT-MDLs and LRLs. The other seven constituents with detection frequencies above 5 percent (Cu, Fe, Pb, Ni, Sr, W, and Zn) had field-blank results that necessitated SRLs greater than the highest LRLs used during the study period. SRLs for these seven constituents, each set at the 90th percentile of their concentrations in the field blanks, were at least an order of magnitude below the regulatory thresholds established for drinking water for health or aesthetic purposes; therefore, reporting values below the SRLs as less than or equal to (≤) the measured value would not prevent the identification of values greater than the drinking-water thresholds. The SRLs and drinking-water thresholds, respectively, for these 7 trace elements are Cu (1.7 μg/L and 1,300 μg/L), Fe (6 μg/L and 300 μg/L), Pb (0.65 μg/L and 15 μg/L), Ni (0.36 μg/L and 100 μg/L), Sr (0.99 μg/L and 4,000 μg/L), W (0.11 μg/L and none), and Zn (4.8 μg/L and 5,000 μg/L). The primary sources of contamination inferred from this review include specific lots of blank water used for the field blanks, and the equipment or the processes used in the field to collect the samples. 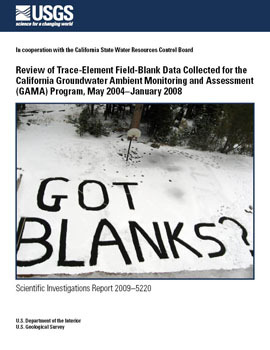 Olsen, L.D., Fram, M.S., and Belitz, Kenneth, 2009, Review of trace-element field-blank data collected for the California Groundwater Ambient Monitoring and Assessment (GAMA) Program, May 2004–January 2008: U.S. Geological Survey Scientific Investigations Report 2009-5220, 47 p.